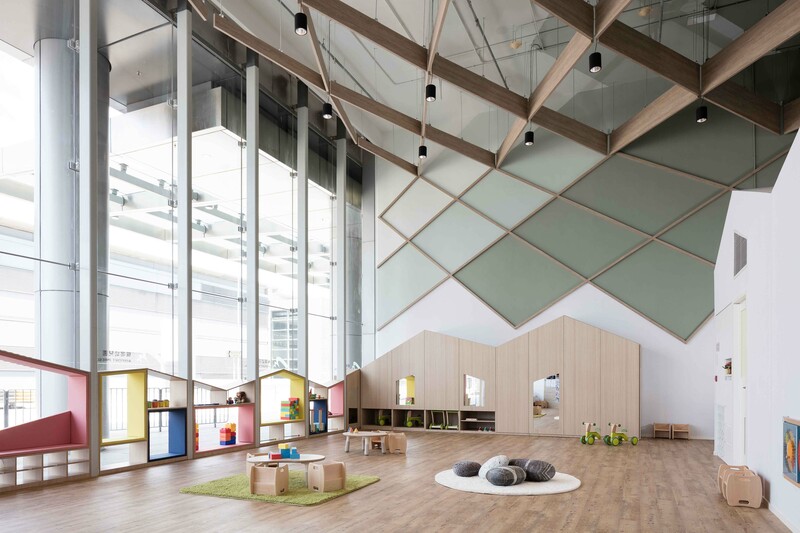 Hong Kong International Airport Preschool by Architecture Commons Ltd. 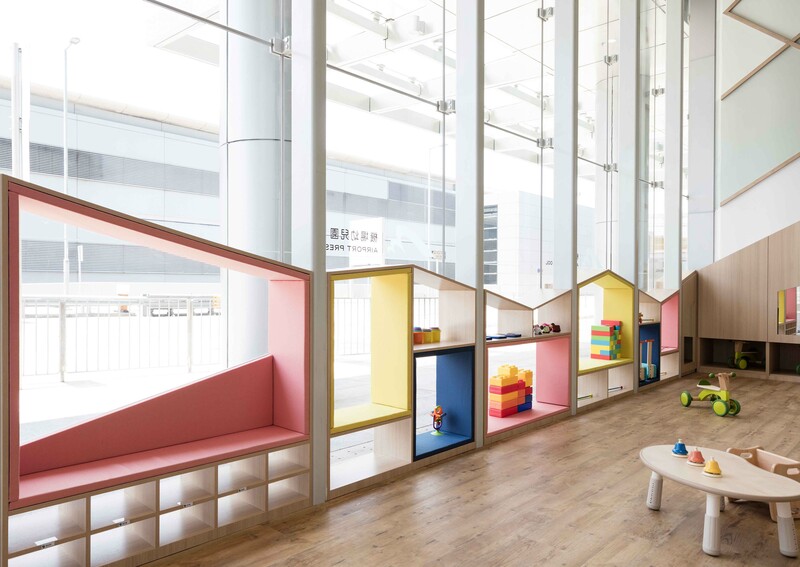 The Hong Kong International Airport Preschool is a new facility that caters to the day care needs of airport employees. Besides serving the employees’ children, the Preschool also hopes to inspire other corporations to offer similar service and ease the loads of many working mothers. 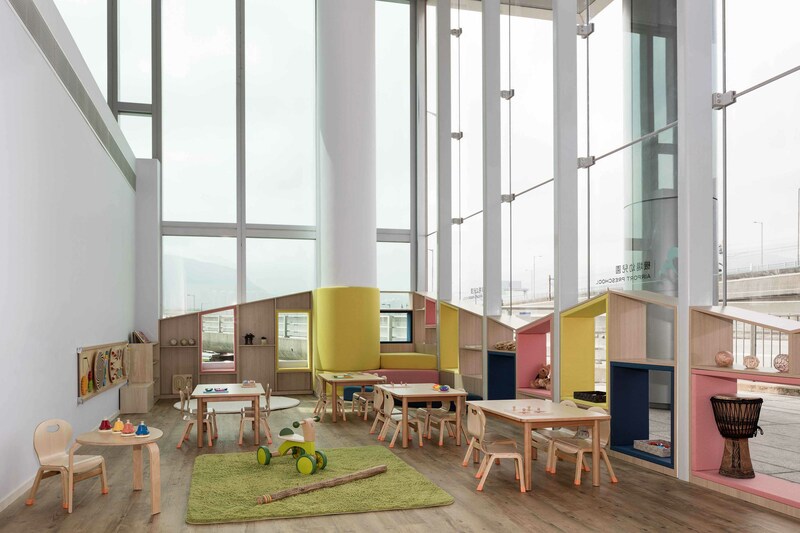 The Preschool enjoys a view to the Lantau Mountains through the seven metres high curtain wall. The design takes full advantage of the height and daylight for the classroom and playground. Rarely do Hong Kong children enjoy so much room in a learning environment. All the utility spaces line the back wall and they are given the form of a series of pitch roofs to decrease the massiveness. More importantly, the peaks and troughs of the rooms profile serve to conceal the mechanical systems, which can very efficiently condition the habitation zone without wasting energy to the void above. Above the utility rooms, the roof pitches transform into a wooden diagrid which wraps the back wall and the ceiling. They conceal the building systems and accentuate the gradient of green colours in the space. Every effort is made to minimize volatile organic compounds in this space, from certified furniture suppliers, to flushing the space with fresh air per Leed standards prior to the opening. 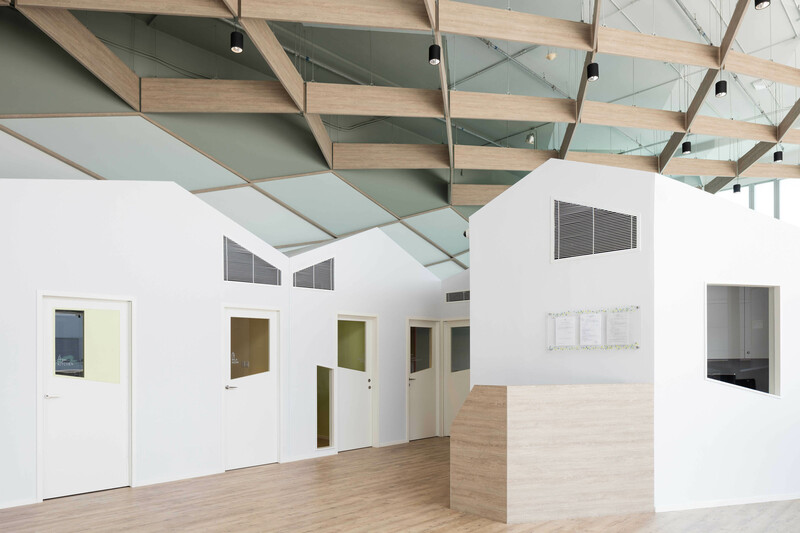 The language of the roof pitch carries over to the display, seating, and storage furniture at the façade. There are many niches in which the children can rest, play, and read, and the vibrant colours add energy and playfulness to the school.